In-line skating or the movement of the roller-skating or roller skating is a very popular sport. However, it is also a great way to stay fit and also strengthen your heart muscle. Move the roller skating is an excellent aerobic activity for people of all ages. If you go to them regularly, you will get the number of health benefits. You will have stronger legs and improves your muscular endurance. You burn a lot of calories so you lose weight. Increase your cardio and respiratory endurance. This will improve you balance and coordination. Regular skating and will support its immunity. 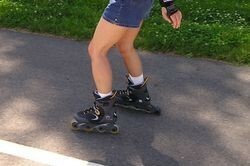 Ride on skates themselves can bike paths, a popular movement but also in the group who can rouse to greater achievements. Skating is divided into three basic groups: fitness and recreation, velocity (speed) and freestyle. When starting out, then of course choose only recreational riding. And you should have especially in mind? Equipment. 's Important, but need not be expensive. When selecting skates for advice - slow rollers are suitable for beginners who are still learning to maintain stability and do not need the speed, the fast you may have experienced skaters. Of course there are the knee, elbow, wrist and helmet. Tempo. Begin First ride where you have enough space. Drive slow, steady pace to increase endurance. Style. If you are a beginner, it is good to find someone who can shed light on driving techniques that you hurt. When you are driving, rock the arms and empowers them. Avoid sudden movements and sudden stopping by to jeopardize joints. Relax. After the ride, treat yourself to massage muscles - so you reduce muscle tension and increase blood circulation, so keep the elastic tissues. Whether you are a beginning skater, therefore, or advanced, you can be sure that it is a sporting activity that has a positive effect on your whole body. How weak stomach? Empower it!